… is truly another man’s treasure. I got this basket from someone’s hard rubbish collection pile along the nature strip last night. It looks like it was a clothes basket in it’s previous life. I inspected it as best I could in the dark and it seemed very solid to me, bar the two handles at each end that had been torn off. Upon closer inspection today in the light, the basket, to me, is perfect. It has not been varnished or painted so when the basket breaks down over time, no chemicals will go into my garden or the stormwater system. With the way many baskets are made, handles and hoops are rarely an integrated extension of the basket body but, rather, are an interlocked appendix to the rattan lattice edge of the basket. In other words, there is really no trace of the old handles left, bar that little twig sticking out from the side which I will pull out later. I have always wanted to make one of these but I have never been allowed to use the spare baskets hanging around at home. The ‘these’ I am talking about are basket planters. They, to me, are the epitome of natural pot planting. 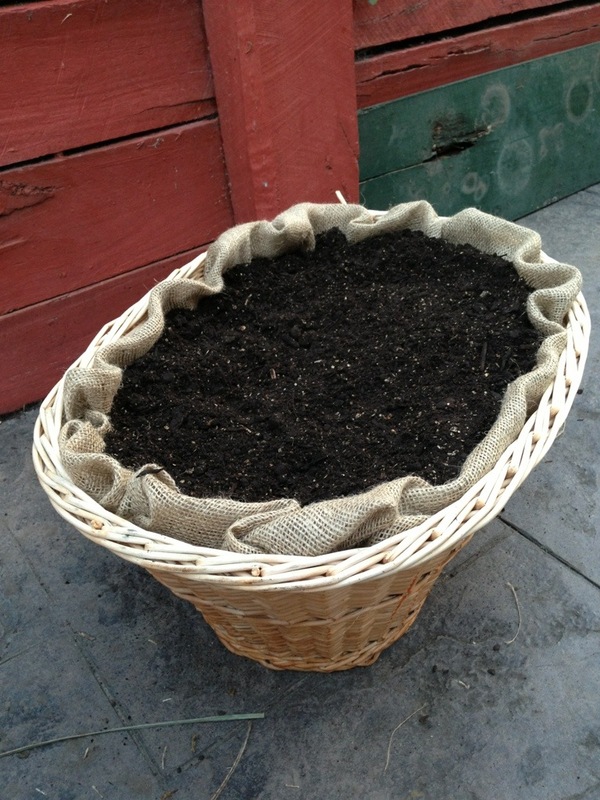 The container, which in this case is a basket, is made out of Rattan (a member of the palm tree family), the liner is Hessian (generally made from the Jute plant) and the soil is organic potting mix with some cow manure raked in. With my new acquisition, I went to the local hardware store to buy half a metre length of hessian that was only $2.50. The bag of potting mix cost $5.00. The cow manure was only a handful so…. $1.50 worth was used, I’d say. All in all I probably would have spent close to $11.00. Yes, that includes a nominal figure for petrol. (below) Basket – See the remnants of a handle on the right? Maybe a reason why it was thrown out. Thank God it was! (below) – See my 1/2 metre of Hessian? All I did next was place the Hessian piece in the basket as if i was lining the entire inside. Any overhang was tucked in the sides with the soil providing enough pressure to keep the Hessian and the tucked overhang in place. (below) – This is the finished product. I think it looks pretty snazzy as how it is but imagine what it will look like when some plants (herbs or flowers maybe?) take over the whole thing, and the elements wear down, discolour and age it. That was amazing. That would be great for herbs. Yea! I planted some chives today so we will see how they go.